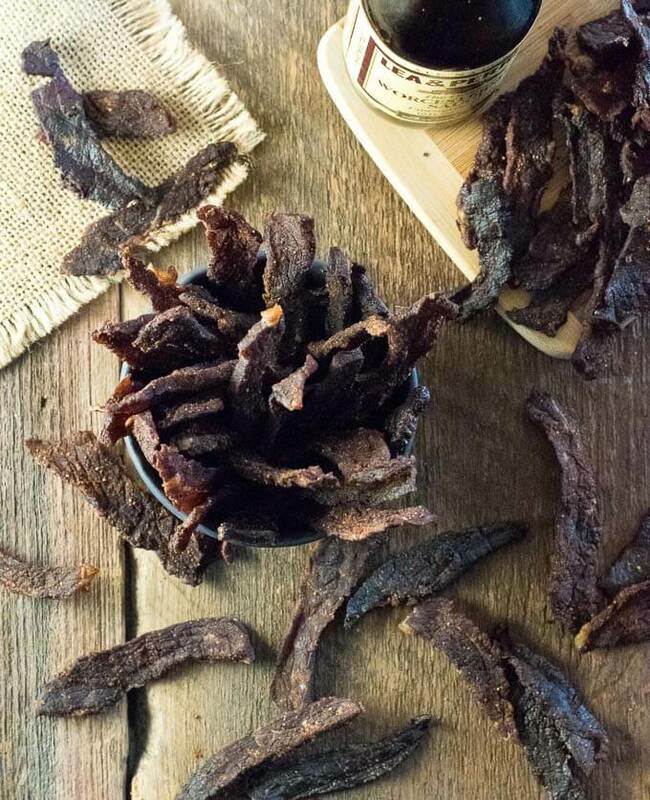 Crafting mouthwatering homemade beef jerky is much simpler than you think. With minimal effort, you can enjoy better than store-bought beef jerky at a fraction of the price. Whenever I go backpacking, my favorite snack to pack is beef jerky. It is pretty much the only time I buy it. At upwards of $20 a pound, it just doesn’t make the final cut on the everyday shopping list very often. Yet, it still remains one of my favorite treats. However, I enjoy making my own homemade beef jerky far more often, which is more affordable and tastes every bit as good! There are two ways to make homemade beef jerky. You can make ground beef jerky using a Jerky Gun, or you can use thinly sliced lean beef for traditional beef jerky. This is a fairly simple beef jerky recipe using thinly sliced lean beef. Not only does using thinly sliced beef not require specialized tools, like a jerky cannon, but it is also healthier because you aren’t using fatty cuts of meat. The best cut of meat for jerky is any type of round roast. It is nice and meaty, reasonably priced, and almost fat-free! 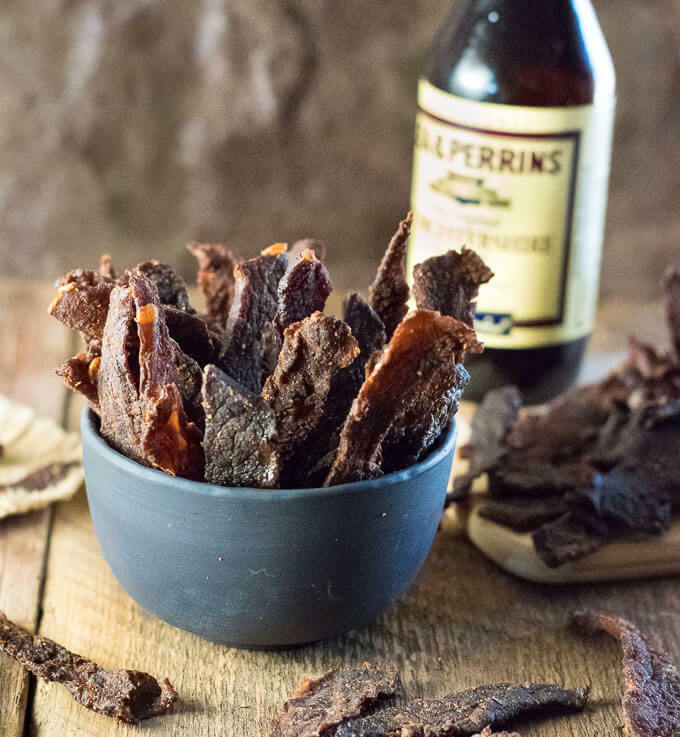 To make homemade beef jerky you simply slice the beef thin, let it marinate in the refrigerator overnight to soak up flavor, and then dry it in a dehydrator or oven. My recipe is a great “original flavor” recipe that can easily be customized to fit your tastes. For example, if you want a spicy beef jerky recipe just add another teaspoon of cayenne pepper. Beef jerky is done when it is no longer moist to the touch and does not bend without cracking. The jerky should bend slightly and then break, having an internal temperature of at least 160 degrees. If it breaks immediately, like a cracker, it is overdone. You should check the jerky throughout the cooking process to check for doneness. If you cut your jerky sufficiently thin it should finish cooking in under four hours. 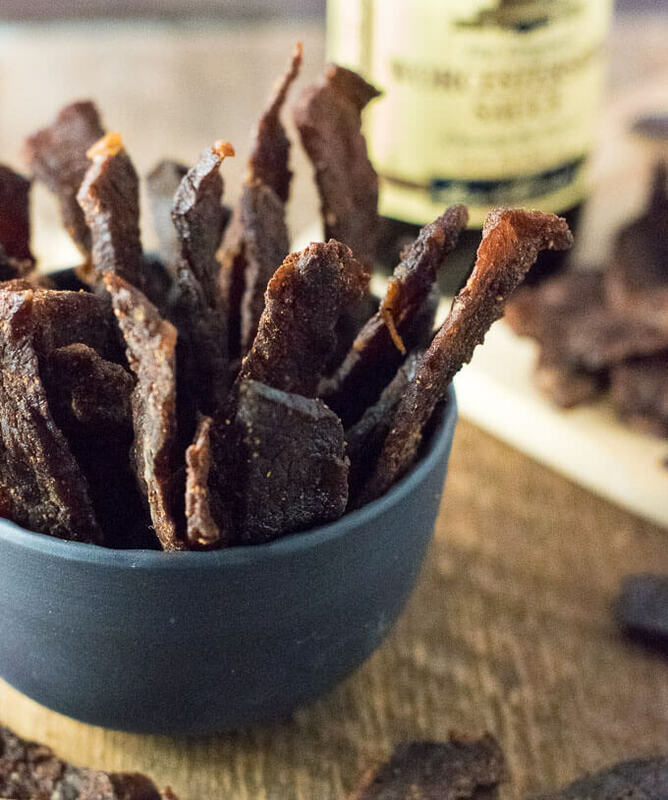 Using a dehydrator is a great option for making homemade beef jerky. Set the dehydrator at 160 degrees, or up to 175 if your model allows you go to go higher. Rotating the racks hourly will ensure all of your jerky cooks evenly. Some ovens will have a dehydrate setting, though even if they do not, your convection feature will work spectacularly as long as your oven lets you bake at low temperatures. Set your oven on convection at 175 degrees, and your jerky should be done in around three hours. The beef jerky can simply be dried on wire baking racks. It is still recommended to rotate the racks in case your oven has any hot spots. Does Beef Jerky Need to Be Refrigerated? According to the National Center for Home Food Preservation, when properly prepared beef jerky does not need to be refrigerated. It is best stored in an air-tight container. (Optional) Place beef in freezer for two hours. This will make it easier to slice thinly. Add all ingredients for the marinade into a bowl and mix to combine. Place sliced beef in ziplock plastic bag (gallon sized) and pour in marinade. Ensure it is evenly coating the meat and place in the refrigerator overnight. Remove beef from bag and pat dry with a paper towel (this will speed cooking time). Dehydrate, rotating racks each hour, for 4 hours, or until the beef jerky is dry and cracks when you bend it. IF YOU LIKED THIS RECIPE you will love my homemade burger recipe too! If you enjoyed reading about my Homemade Beef Jerky recipe then you should probably like me on Facebook and follow me on Pinterest too. That’s what I would do at least, because if you don’t get to know me but you still use my recipe it is kind of like taking candy from a stranger, and your mom taught you not to do that. Don’t disobey your mom, subscribe to Fox Valley Foodie today. 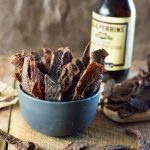 This is now my go to beef jerky recipe! It’s our favorite jerky recipe. Should home made beef jerky be refrigerated? You can if it makes you feel better, however, when made properly jerky should be shelf stable. if made in an oven, is it necessary to keep the door cracked upon for ventilation? or is it okay to have the door closed? Can I use ground beef and a jerky press for this recipe? If so, how long do I put in the dehydrator? You will need a recipe specifically for ground beef jerky for that. The seasoning amounts will likely be different. Excellent recipe. I’ve made it a few times now and have had excellent results each time. I like it spicy so add more cayenne. I make in the oven with the fan on. I air dry for 3 days and keep it in mason jars. I’m not sure how long it lasts as we eat it very quickly; usually within a few weeks. I freeze it and cut it with a very good bread knife as I find it easier. Cut at around 4mm as it will end up about half that when done. Can’t miss with this crowd pleaser, thanks! How thin do you cut your roast before marinating? Aim for about 1/8 of an inch. Wow! I have made this jerky a bunch! Always the same amazing result! Something i like to add to the mix is red pepper, like maybe a teaspoon. I’ve only made this 1 time a few weeks ago and only did a half pound and reduced the ingredients to accommodate not over flavoring. What I dehydrates that day did turn out actually not bad at all, I didn’t have liquid smoke that batch. But today I’ve properly weighed out ingredients for a full 2lb suggested amount. Liquid smoke I believe will pop the flavor to its fullest. That is for sharing this easy 1 2 3 step method. I’ll repost when donit’s done. I was surprised how well this recipe worked. The beef jerky tastes great and was extremely easy to make. I used a dehydrator by my dehydrator does not have a temperature control and took six hours to dehydrate.